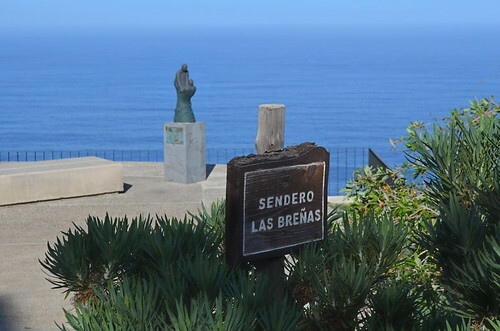 At the Mirador de Las Breñas in El Sauzal there’s a sculpture dedicated to the fishermen who played an heroic part in an incident which took place off the coast below on 16th September 1966. A DC-3 aircraft belonging to Spantax airline left Los Rodeos airport en route to Las Palmas. Over the north coast its left engine failed and the pilot was forced to land in the ocean just above Los Angeles Bay. Local fishermen rescued all but one of the 23 passengers and 4 crew on board. One man, a 62yr old lawyer, refused to leave the aircraft and went down with the plane. The wreckage still lies in 33 meters of water off the coast below. The sculpture is a representation of someone being hauled from the waves by the strong arms of a fisherman. 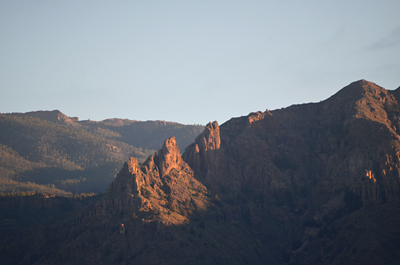 At waist level of the two figures, stone waves climb like mountain peaks, just as they do, crashing on the rocks of the coastline below. Touching the sun-hot, smooth, stone heads of the figures imbues a feeling of connection between that event and the here and now. It’s a fitting tribute placed in the perfect setting. It was another glorious December morning when Jack and I decided to take a coastal stroll along a path we had never explored. 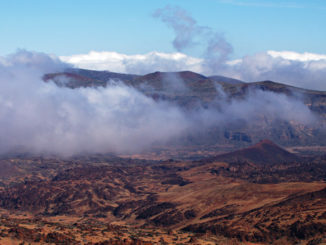 Standing at Mirador de Las Breñas, perched above the untamed and glorious north coastline with its grandstand view of Mount Teide (or at least, it would be were it nor shrouded in calima that day), the view, the weather and the silent tribute to a small but significant drama all augured well for our stroll. 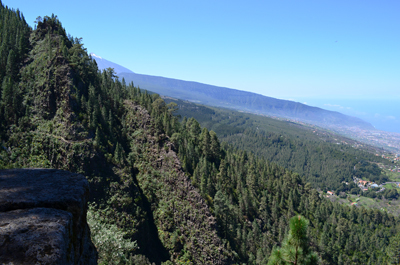 What we hadn’t quite bargained for was the 175 metre descent over a distance of 700m of cliff that gets you from Mirador to coastal path. For us, that was a bonus. 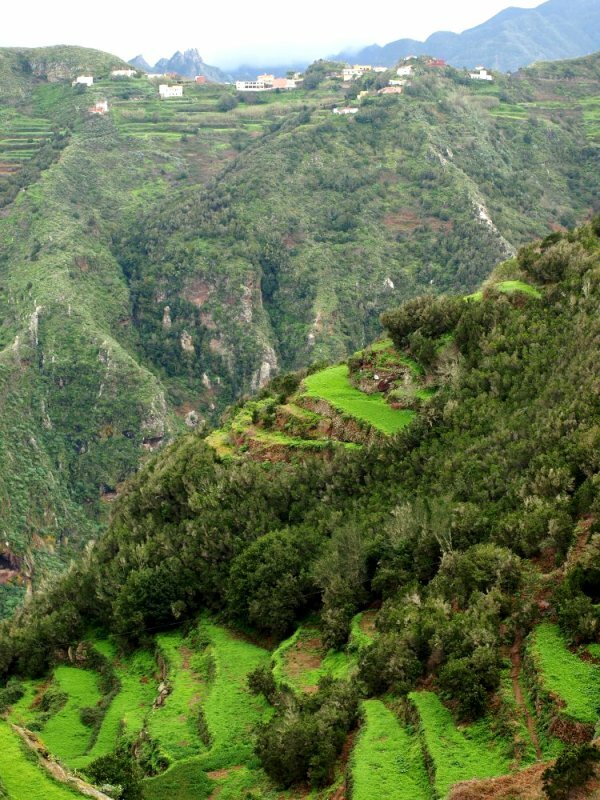 Having expected this to be little more than a stroll, the descent and ascent are enough to raise it to the level of a walk, albeit a short one. For those who don’t want to climb a cliff, there’s a large car park further along the coast with direct access to the path. By the time Jack and I got a third of the way down the path we’d already worked up a sweat and peeled as many layers as public decency would allow. 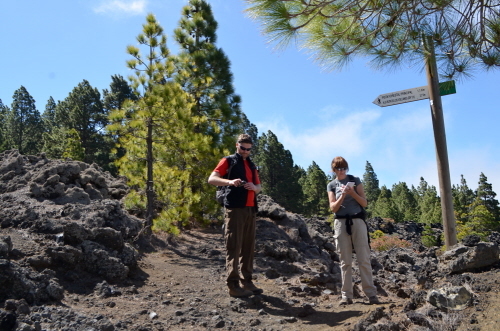 Reaching sea level, the path beckoned in both directions. 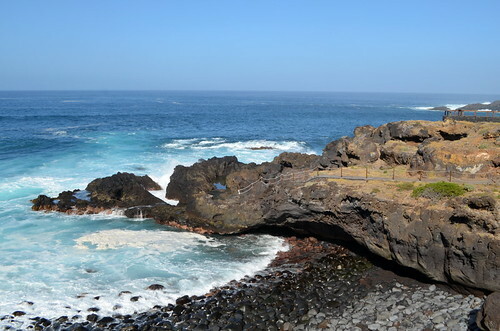 Extending for just over 2km from El Puertito to Rojas, the coastal path covers three distinct areas: Puertito, Cangrejillo and Rojas. 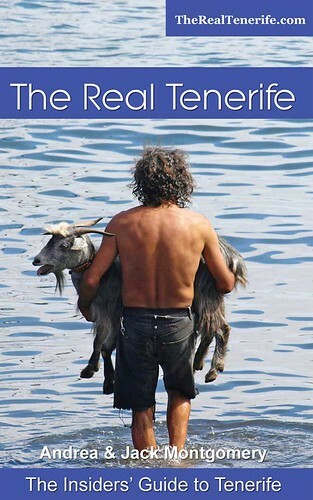 Until the Ley de Costas was implemented, giving authorities the right to demolish illegal dwellings constructed within a certain distance of the coastline which is deemed to be public property, this area was a summer shanty town to some 400 dwellings, many of them hewn into caves above the sea line. Once cleared, the path was constructed and the whole coastline reclaimed as a public right of way leaving the empty cave houses standing as testament to what cave dwelling with the sea on your literal doorstep must feel like. Information boards alongside each former settlement have photographs of what the area looked like when the houses were still occupied. Far from being a flat, straight line, the Costa Acentejo path follows the contours and undulations of this rugged coast where Atlantic rollers crash onto the rocks below, sending magnificent plumes of spray exploding into the air and splintering back down onto the rocks in a frenzy of milky foam. Paved access runs off at intervals to multiple rock pools and smaller pathways weaving their way to the water’s edge. 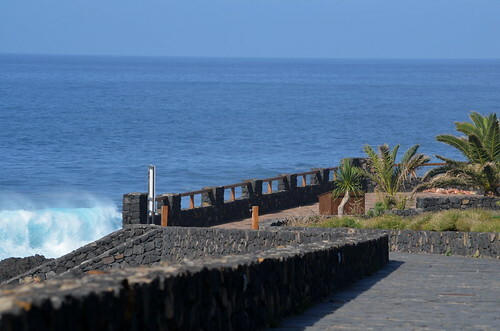 Along its length, benches and small viewpoints line the path providing places to sit, and stare, enthralled by the constant movement of the ocean and the distant shoreline that stretches all the way to the lighthouse at Los Silos. 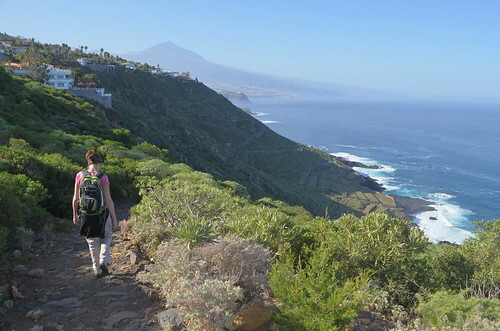 Coming in at just over 5km to do a full circuit, and including the descent and ascent from Mirador de Las Breñas, this is a peach of a coastal walk with the bonus of being the only place on Tenerife where you can currently find the rare, endemic plant, the Pico de El Sauzal (Lotus maculates Breitf) growing in the wild. 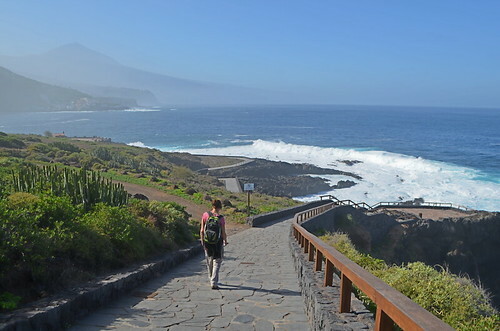 If you begin the path from the car park at Rojas, it covers some 4.5km of easy walking, most of it also accessible for those with walking difficulties. 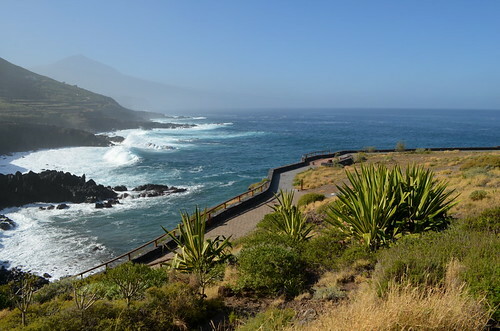 And for anyone who just wants a spot in which to soak up the beauty of the north coast of Tenerife, make your way to Mirador de Las Breñas, look down at the surf below and imagine what it must have been like for the passengers and crew of that aircraft and the heroic fishermen who saved their lives that day in 1966. Had the waves been as high as they were the day Jack and I walked this path, it might have been a very different story. 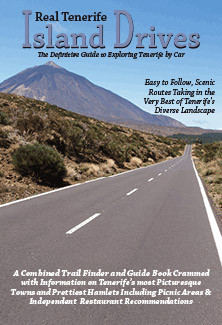 You’ll find more coastal walks in our brand new complete guide to self-guided walking, Walk This Way Tenerife. 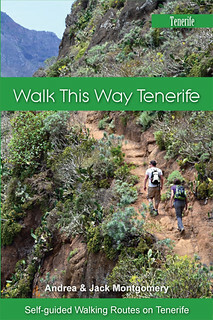 NB Most of the routes contained in Walk This Way Tenerife are the same as those in Island Walks PDFs.